IF you’re skinny like me and stupid enough to go to Hokkaido in winter, it will take you some time to put on your OOTD (outfit of the day) every morning which, in my case, meant 13 pieces of clothing stacked two feet high on the bedroom table the night before. 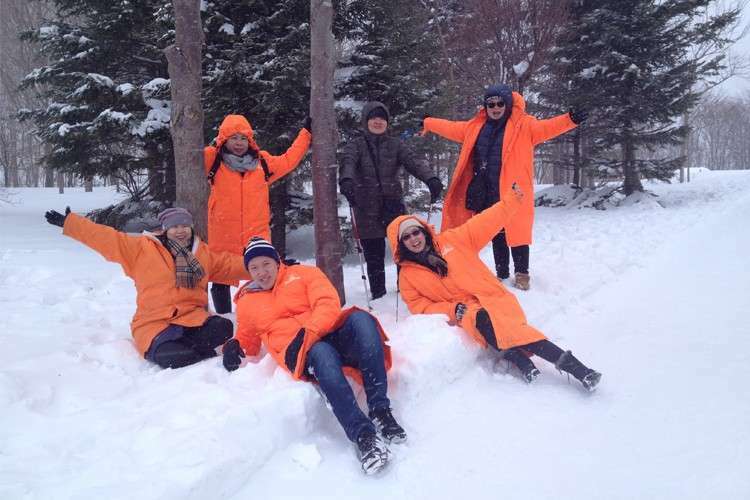 Hokkaido at -8 degrees Celsius is nothing like my home in the balmy tropics. And our guide, Amy, in between regaling our group with stories on creative bento boxes and Japan’s high-tech toilets, which play music to muffle the sound of one’s labors inside the cubicle, dangled nightly the prospect of respite from the freezing cold with the onsen, the traditional Japanese hot spring bath. The only catch was: “You have to go in naked—with other people,” she said. The onsen was out of reach. 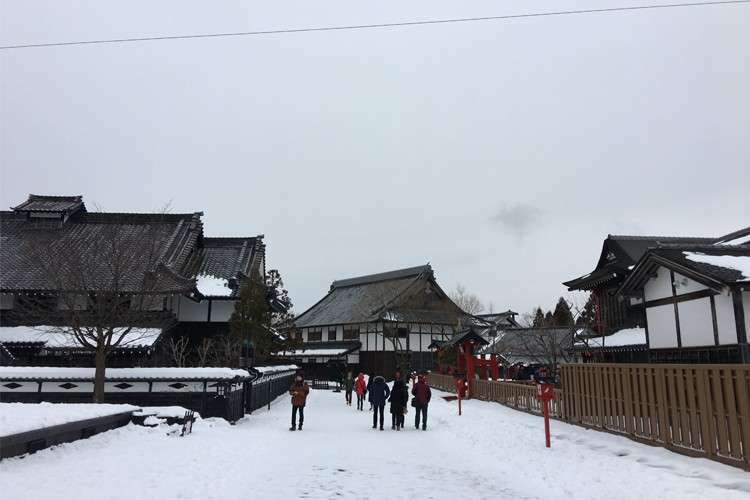 For as tantalizing as the idea of thawing was, baring our flesh in public went against everything we had learned in Catholic school, though the bigger reason we gave the onsen a wide berth was the fear of running into anyone we might know there. We decided to face the ice head on. 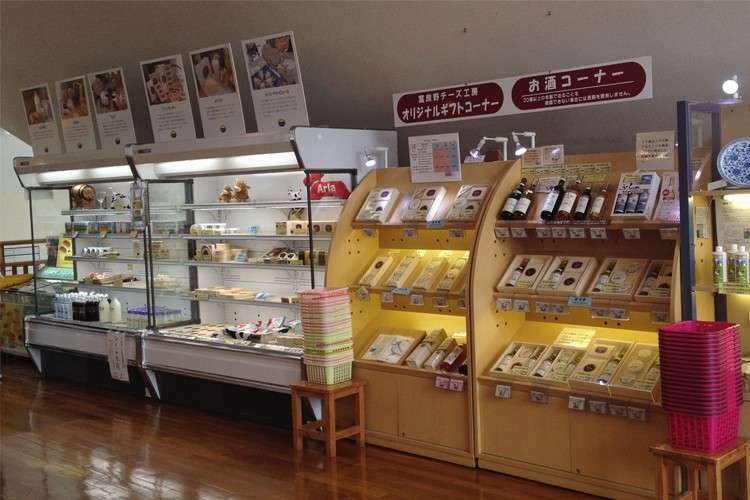 In Furano city, we made (and ate) our own ice cream in the Furano Cheese Factory, then defrosted ourselves in the sweets café and farmers market in the Furano Marche shopping complex, before putting on special snowshoes to tread on the soft, deep snow on Furano’s natural ski grounds. 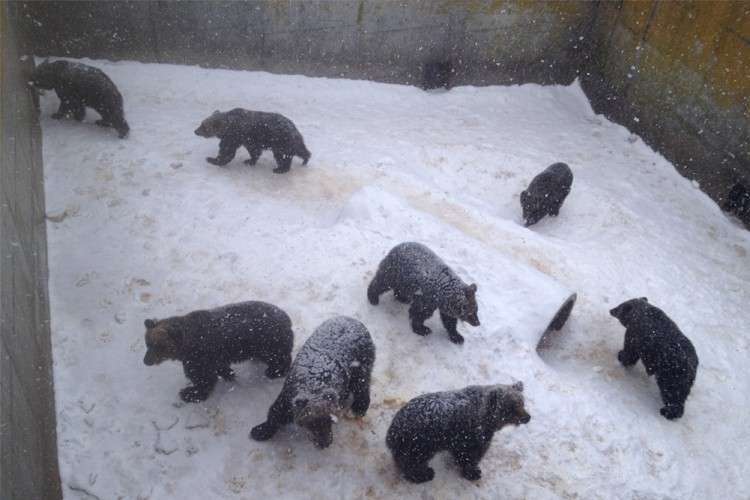 Although the average age of our six-member group was 50, we acted like unsupervised children, lying on the snow for pictures, entering a bar made of ice (though we did not order any drinks), and falling in line behind five-year-olds taking slides down bunny ice slopes. Steps from the ski grounds, a timber walkway to the Ningle Terrace revealed an enchanting showcase of cottage-shops among pine trees that at night, glowed like a Christmas village with specialty crafts and cakes that melted our hearts though not our faces still frozen in the sub-zero temperatures. 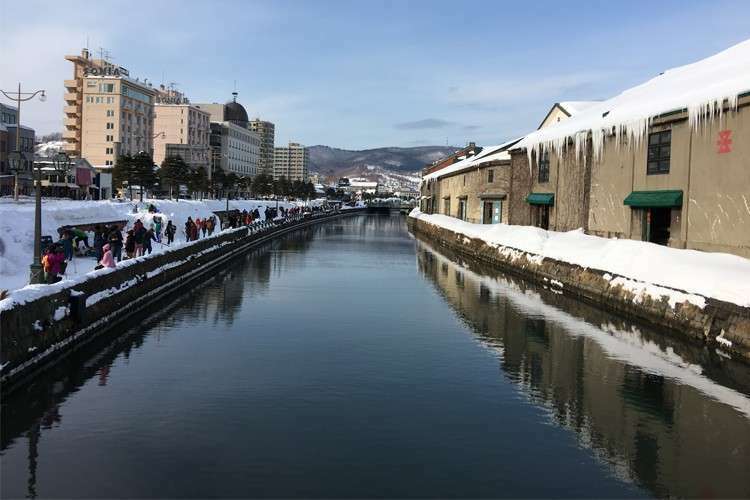 In the port city of Otaru the next day, we took snaps of the Otaru Canal lined with romantic old-fashioned street lamps and old warehouses-turned-restaurants, shops and museums, never once slipping on the icy streets (meaning that our guide, who wasn’t wearing spikes, did); then hit the Otaru Music Box Museum, where music boxes for sale came disguised as carousels, crystal angels and sushi. For our sweet fix, we turned to LeTao, whose cheesecakes, chocolates and crème brûlée are worth all the calories; and the Patissier Kitakaro, for cream puffs and soft serve ice cream. 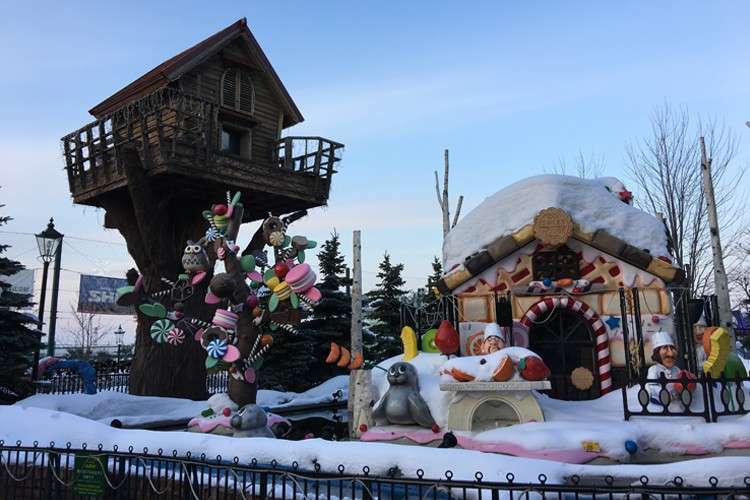 At Shiroi Koibito Park, home of the Ishiya chocolate factory, the entrance decked with giant sweets made it look like candyland before we even got to its famous slim butter cookies with chocolate. 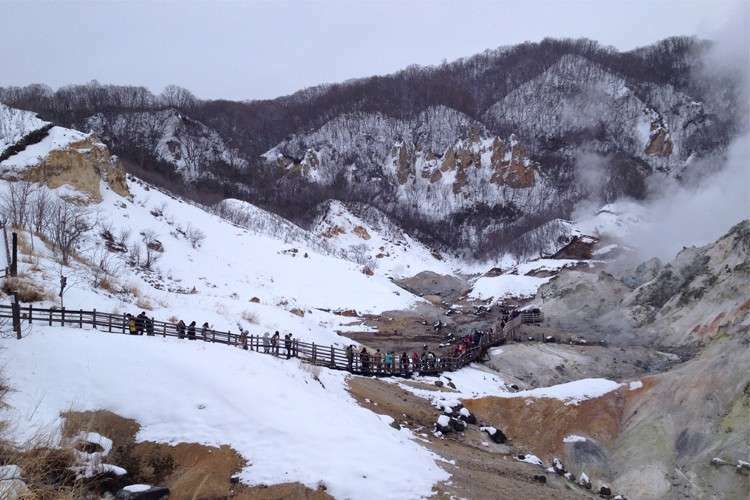 In Noboribetsu City was a walk to remember at the Jigokudani or Hell Valley, whose hot steam vents, sulfurous streams and other volcanic activity—the main source of the city’s hot spring waters—were the closest we, Virgin Mary-types, would ever get to an onsen. The breathtaking view called to mind the 1973 film Lost Horizon about a hidden paradise sheltered in the mountains of the Himalayas, although that film did not feature any volcanic activity. For a panoramic view of Lake Toya and the Showa Shinzan mountain, we took a six-minute ride on the Showa Shinzan Ropeway to an observation deck on Mount Usu where, instead of looking at the view below, we took videos of ourselves gleefully sliding down one of its small slopes on sleds. Not impressed were the small black bears in that city’s Bear Ranch trudging back and forth in their enclosures all day in the blinding snow, as if they had business to attend to. If you want a show, you’ll have to go to the Noboribetsu Date Jidaimura, a theme park on the Edo Period (1603-1867), where humans can put on really wacky performances on ninjas and Oiran courtesans. 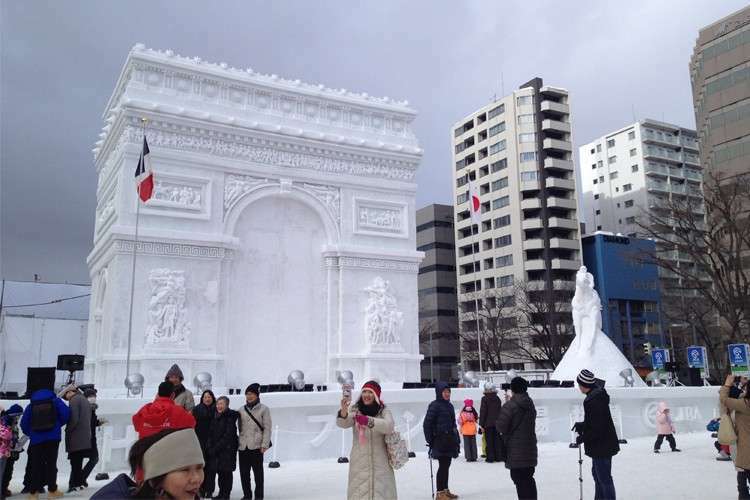 In Sapporo City, home of the Sapporo Snow Festival that we had come to Hokkaido in February for, snow and ice sculptures of Hello Kitty, Japanese comedian Daimaou Kosaka of Pen-Pineapple-Apple-Pen fame, Anakin Skywalker of Star Wars, a temple and the Arc de Triomphe of Paris were among the more than 150 lining Odori Park and the main street in Susukino. Amy loved us. Actually, she loves all Filipinos in general because, she said, Filipinos will eat anything, and with gusto, even under the time limits set by Hokkaido’s eat-all-you-can restaurants. We did not disappoint. 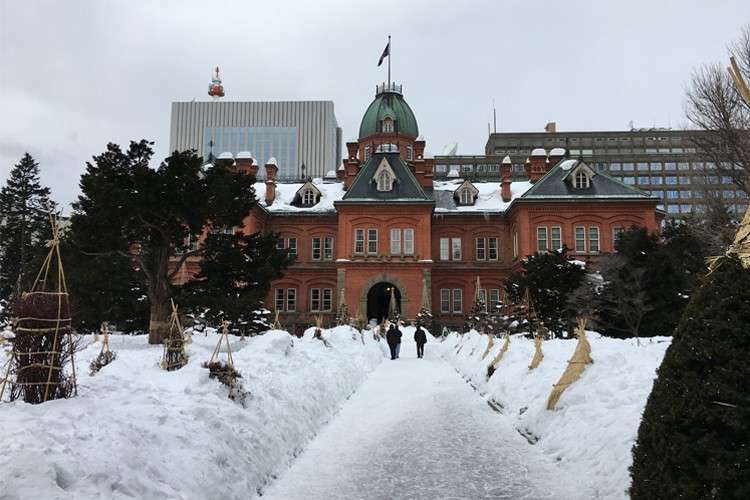 We devoured everything—the food, the sights; the falling snow so enthralling that in our zeal to capture it on video, we all rushed out of the building, unwittingly leaving our luggage unattended in the hotel lobby on our first day in Hokkaido.